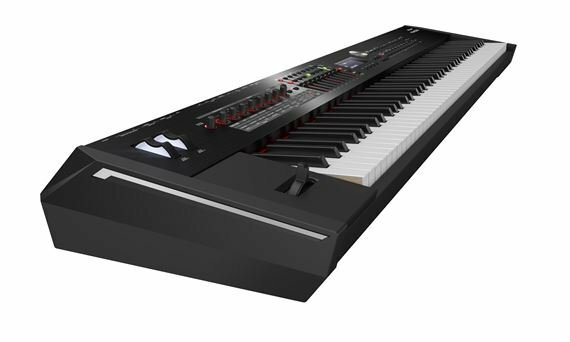 Order your Roland RD2000 Digital Stage Piano from AMS and enjoy 0% Interest Payment Plans, Free Shipping, Free Extended Warranty & 45 Day Money Back Guarantee. Featuring Roland's finest action ever in a stage piano, the RD-2000 is a dream come true for the performing keyboardist. The RD-2000 features dual sound engines that power Roland's best acoustic and electric pianos ever. There’s a massive selection of top-quality ensemble sounds to cover any musical task, as well as two wave expansion slots for adding even more sounds. And with its innovative modern interface, the RD-2000 is the perfect master controller for working with today’s software-based instruments on stage. The RD-2000 supports Roland’s newly developed RAINLINK protocol, which provides high- resolution velocity control for compatible software instruments. This ability is particularly effective for deriving the subtlest tonal nuances out of supported software-based pianos. Actual weight can vary slightly from that indicated due to the fact that wooden parts are involved. The RD2000 has all bases covered! It has internal sounds that you can add from the website; a nice weighed keybed; built xlr and 1/2 output jacks; a built audio interface if you like to use your computer on the gig AND the faders and knobs transmit midi CC so it can be used a total midi controller with Main Stage, Cantabile, Ableton and the like!! Great job Roland!! One request Roland, could you make one the size of the RD-64?? I would buy it yesterday!!!! The best digital piano on the market. Absolute best investment I have ever made for my studio. The sounds are as impressive as the actual instrument. I'm loving this RD2000. I play live, and record/produce for a living. This board is a dream come true after years of playing midi controllers via Mainstage live, and just using those boards for producing with virtual instruments. As a trained pianist from my early years, I didn't know how much I missed playing a professional top-of-thie-line board. This RD-2000 definitely is worth its weight in gold. I know there's other brands out there that cost a little bit more, but I took a chance on this new Roland, and I couldn't be happier with the results, and its inspiring me to write and record more by just having it ready to go in the studio. It's gonna take some time to really go down the rabbit hole and see all that I can do with this board. I'm looking forward to making it my main live performance board and still using mainstage, but with only one midi controller instead of two 88's. I've played Nord, Yamaha, Kurzweil, even tried the NI Komplete Kontrol s88. This board rules!! Wow I am liking these keys....simple and upfront. Love the ease of editing the tones and making up your own sound. Simple and easy, straight forward. Most of all, am just loving how the keys feels on my hand. very impressed. Roland has done it with this keyboard. Piano sounds are based off of the V-Piano sounds. The rest of the sounds haven't gotten much of an upgrade though. The feel of the keys are some of the best I have felt since taking up keyboard playing. I normally play a Arturia Keylab88 controller. The keys on the Roland are a synthetic ivory with a wood feel. And the Fully weighted keys don't feel clunky like a lot of controllers but the closest to a real piano as possible. What truly sells this keyboard, especially if you use a laptop and sampled patches, is the fully integrated internal to external setup. You can simultaneously run a program like Mainstage/ Omnisphere with your internal sounds of the keyboard. My worship leader seamlessly can switch from onboard to Mainstage with just a click of the button and/or a slide of a fader. Best safety net for tech issues. If you want full integration with your DAW this is the keyboard for you.